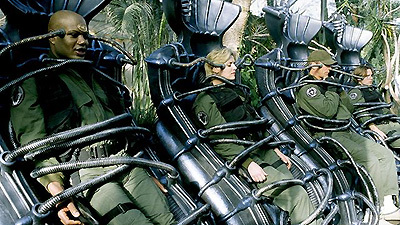 SG-1 visits P7J-989, a beautiful garden world, and finds people sleeping in strange metallic chambers. When they too are caught in the chambers, they awaken to find themselves reliving pivotal and painful events in their lives in the hope of changing the outcome. A shadowy figure, the Keeper, explains that they are part of an elaborate game of virtual reality being played for the residents in the chambers. He is lying when he says that his planet is uninhabitable, but SG-1 must first escape from their virtual world in order to convince the residents to leave their own chambers. P7J-989 was destroyed by a chemical disaster as a result of advancing technology 1022 years ago, and rendered uninhabitable. The surviving residents placed themselves in suspended animation and have survived since then as the planet regenerated itself. The chair devices nourish and stimulate the senses, and channel experience and imagination into and out of the mind. They leave small puncture wounds in the temples, spinal cord and several abdominal areas. Teal'c and Carter were protected from output by the device, perhaps because of the influence of the Goa'uld symbiote and of Jolinar. In 1982 Operation East Fly was a mission to retrieve a Russian agent named Boris from a house in East Germany. Members of the team included Captain O'Neill and Captain Kawalsky, under the command of Colonel John Michaels who was killed in action by snipers. Teal'c was seen as "Thomas", a member of the team. Daniel's parents, Dr. Melburn and Claire Jackson, were crushed to death by an exhibit in a freak accident at the New York Museum of Art when Daniel was a young child. The Goa'uld have experimented with time manipulation for years. Kawalsky used to play street hockey with O'Neill.